When Blackberry Smoke’s album Holding All The Roses went #1 on the Billboard Country Albums chart in February 2015, it was the first time an independently-released country album had climbed to the top of the country charts in the modern era. Holding All The Roses shattered the glass ceiling, and since then we’ve seen numerous independent records, as well as records from country legends and even mainstream traditional upstarts ascend to the #1 position when before such a distinction was a pipe dream. 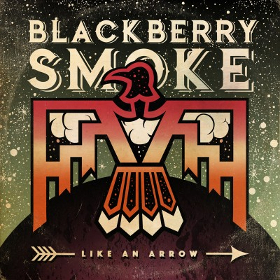 And now Blackberry Smoke has done it again. The Southern rock band’s latest album Like An Arrow has once again put them in the #1 position atop the country albums chart. Released on October 14th, it sold an estimated 18,253 copies to beat out fierce competition from the latest records by Florida Georgia Line and Jason Aldean, as well as the continued strong sales of Chris Stapleton’s Traveller. The numbers are also good enough for #1 on the Folk/Americana chart, #3 on the Rock Albums chart, and #12 on the all-genre Billboard 200. Blackberry Smoke also put together a strong showing in the U.K., coming in at #1 on both the Rock and Independent albums charts. Blackberry Smoke will be heading to the U.K. in the spring, and recently performed on the BBC’s Later…with Jools Holland ahead of the release. 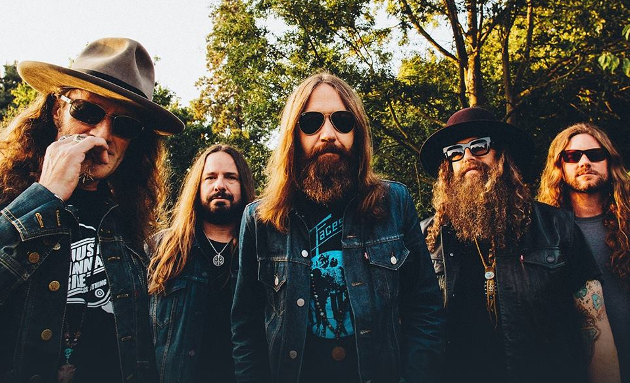 Blackberry Smoke’s relentless touring is given credit for helping them to amass the fan base to help push them to #1 in an era of dwindling album sales. And who says, there is no good news anymore! Where do you get those numbers from? I’ve been looking and can’t find them. BBS doing this months before Stapleton turned the industry on its end proves 2 things. it proves that there was a market for this music and that people were fed up with unsubstantive pop infused music. But it also spoke about BBS as a group. Doing it the first time could have been written off, but by doing it a second time they can cement themselves as a legitimate contender in this new and exciting time of actual and “mostly” quality Country Music. I’m angry. I will confess to being angry. Blake Shelton is still on the tube, Luke Bryan and Sam Hunt are still on the radio, and Bobby Bones still has a show. And I have been a pissed off Country fan for the better part of a decade. It’s real late where I am and I’m a bit emotional right now, and I’m best known around here for always assuming the worst and being a bit of a grumpy fellow. But I’ve been feeling real optimistic about our genre lately. Let’s hope BBS has got a couple more good albums in store. Love this band . They’ve put Southern Rock back on the map again . Or country rock . Whichever it is , they’ve earned it . Charlie Starr and Co. have jammed to the likes of alot of genres of music and have done it well. From opening for ZZ TOP and Govt.Mule to headlining there own shows. They are for real There picking up where Marshall Tucker Band, Outlaws, Allman Brothers band Charlie Daniels band and the likes have left off . Blake’s actually pretty good on the tube (better than he is on the radio) and he tends to give his contestants way more traditional country stuff than he actually sings. I agree, Fuzzy. No sophomore slump for these guys!!! Two #1 records for BSS should get people interested!!! Congratulations to the guys on another well deserved #1 record!!!! Just bought the ‘new” CD by the Cox Family…WOW ! What a refreshing set . The Cox family are some our best friends! There’s a lot more to come from them! Right on LLN …..That Cox Family album is one terrific record …vocally and instrumentally , not to mention the production . Absolutely loving it top to bottom . Blackberry Smoke has been clawing their way to the top. Weather it be country , Southern Rock or whatever label you want to give it , they’ve worked hard playing opening acts for likes of ZZ TOP and Govt.Mule they have proven there for real . Kudos Charlie Starr and company . Your outrageous and your music damn good . Keep it going . I’ve seen them 4 times and yet to be disappointed. I hope this also piques interest in their older stuff. Whippoorwill is their best album. Little Piece of Dixie is no. 2. We’ve already seen BBS twice on their “Like An Arrow” tour and we’re getting ready to see them for a third time next week. Yeah, we travel a bit when necessary… and we have not been disappointed! GET OUT AND SEE THEM PLAY LIVE! Charlie Starr is a lyrical genius! !…and the band is so tight together where they all gel together to perfection!…Best live act out there!!! I really like this new album. The playing is stellar. If you are a BBS fan, this album is spectacular.. I hope more people get on board. I absolutely love these guys !! If BBS is country, then The Georgia Satellites debut album is the greatest country album ever released …with In the Land of Salvation and Sin being a damn close second. Hey man, if you like smoke you need to check out this small band out of Georgia called Sanctified Revival. Newer band with the same smoke feel, also puts on a live show similar to smoke.